"I spent 30 days in a treatment facility in Arizona from mid-July until mid-August. Being in that place allowed me to come face to face with issues from my past as well as my current struggle, and placed me in a place to successfully overcome my overmedication via alcohol," Perry said in a message to his followers on Facebook Tuesday. "I'll be honest, being in treatment was one of the most difficult things I've EVER experienced; however, often times our next steps in life are not easy even though they are the best things for us," he added. Addressing questions from fans about his future plans, he said he expects to return to ministry at some point with the help of his therapist, John Walker. "The best move for me in regards to getting better is to humbly place myself under the authority of someone who I can trust and is qualified to walk me through this next season. As I often say, you can't do life alone, and it's going to take the help of other people if I am going to fully embrace the healing that needs to take place in my life," Perry said. "John Walker has been my therapist for around seven years now and I hold him in highest regard. In those seven years I've allowed him to speak into me; however, I am now humbly submitting myself to him and giving him authority over me as I believe he will serve as my pastor, my psychologist and my spiritual formations director in this next season," he continued. "Together John and I will work through/develop a plan that will lead to the health and well-being of my family, and, over an extended period of time, a return to ministry (sic) is some sort of capacity," he added. Perry then asked for prayers for his family and continued healing and said he will "'go dark'" on social media to facilitate the process. "Per John's request, I will not be posting on social media or responding to any sort of comments until he says I can do otherwise. He feels it best if I disconnect from social media so I can better connect to my family and the process he is developing for me. I will begin to post and respond again when he says I am able to do so — this is my first step in submitting to his authority and please pray I will stick to it," he said. "I can honestly say I am excited about the future God has for me and my family. The one thing I keep hearing from Him over and over again is that He is not finished with me. I have no idea in what capacity He will use me in over the next several years; however, I do know that it will be immeasurably more than all I could ask for or imagine — because, in Christ, the best is ALWAYS yet to come," the post ended. 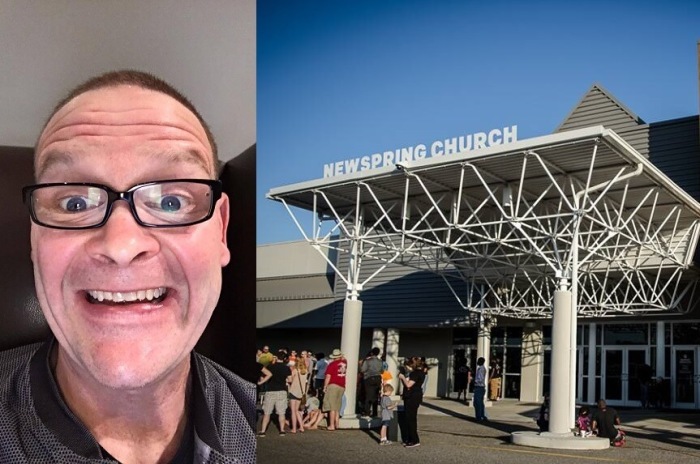 In early July, NewSpring Church Executive Pastor Shane Duffey announced that Perry had been removed from the helm of the church after several months of failed intervention efforts. "Because Perry chose not to address these ongoing issues and didn't take the necessary steps toward correcting them, he is no longer qualified as outlined in I Timothy 3 and the church's bylaws to continue as pastor of the NewSpring Church," Duffey said.